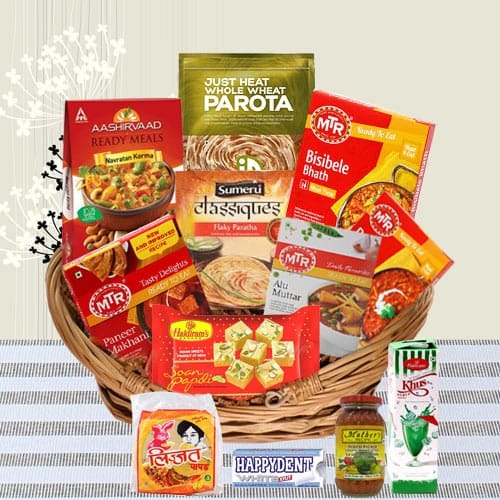 Try out something special by sending this online gift of Superior Festive Dishes North Indian Dinner Gift Hamper to your near and dear ones. This Basket is filled with a Pouch of 200 gr. Mini Lijjat Papad, a Carton of 285 gr. Aashirvaad Ready Meals- Navratan Korma, a Carton of 300 gr. MTR Ready To Eat- Alu Muttar, a Pouch of 350 gr. Id Just Heat- Whole Wheat Parota (3 Pcs. ), a Pouch of Sumeru Classiques- Flaky Paratha (Multi Layered) (4 Pcs. ), a Carton of 300 gr. MTR Ready To Eat-Tamarind Rice, a Carton of 300 gr. MTR Ready To Eat- Paneer Makhani, a Carton of 300 gr. MTR Ready To Eat- Dal Tadka, a Pouch of 250 gr. Haldirams Soan Papdi, Mothers Mixed Pickle, Haldiram Khus Syrup and Happy-dent Chewing Gum.